I crochet 1/12 scale dollhouse bedspreads and rugs - and some thoughts about how I do it. I spend most evenings with a ball of thread and a tiny steel hook, crocheting miniature bedspreads for the dollhouse. I especially love stitching tiny and colorful granny square afghans. I also use white and ecru threads to crochet dainty Victorian-style bedspreads. And sometimes I knit a bedspread with fine vintage yarn. Miniature dollhouse bedspread features very dainty filet crochet. Miniature crochet oval rugs for your dollhouse - I love the edging. How I crochet 1/12 scale. ​I occasionally get questions from people looking for patterns to make their own dollhouse bedding. I don't sell patterns for my miniature projects, but here are some thoughts about my creative process and my enthusiasm for crocheting small. I can't resist dollhouse crochet with lots of color. Crochet thread is available in a rainbow of colors--tatting thread too. I can never pass up a dollhouse project that features bold, colorful motifs. Miniature granny square blankets are a great way to experiment with different color combinations, as you can change color every row or two if you want. I join the patches together as I crochet. Working in the loose ends is tedious, but it's best to do it as you go. These miniature patchwork bedspreads are a great way to use thread leftover from other projects. It can be tricky though to match the thread weight, so the patches are the same size. This cottage style miniature bedspread works great with hand-painted furniture. Bright colors and tiny hearts give a rustic look to this dollhouse bedspread. Granny square dollhouse bedspread worked with tiny motifs. Consider filet crochet for your traditional miniature bedspread. Filet crochet worked in the round gives this tiny bedspread lots of Victorian attitude. 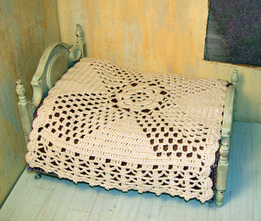 This OOAK bedspread is worked with traditional filet crochet, but in a modern lavender color. You may want to limit yourself to white or ecru thread, if you plan to crochet a traditional style bedspread. The play between light and shadow really works with light colors to make the stitches stand up and shout. I have found that a beautiful stitch design can be swallowed up with a darker color. The other advantage of a bedspread stitched in a solid, light color is that it works with lots of different home decor styles. (The country patchwork design is more limiting, even though they are more fun to make!) Filet crochet is one of my favorite stitches to use for that nostalgic bedspread. It gives an heirloom look, but is easy to do. This stitch uses alternating blocks of double crochet stitches and open spaces to create a design. 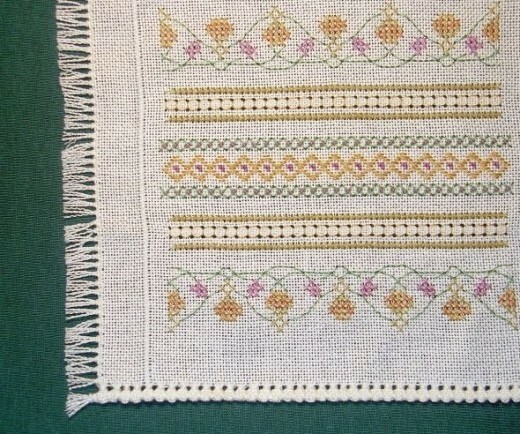 It was often found in Victorian needlework. Depending on the thickness of the thread and the size of my hook, I find that I can work on a mesh of about 20 to 25 blocks to cover the top of the miniature bed, and then I add crocheted edgings on both sides. If you explore filet crochet patterns, you will find that they come in chart form and are easy to follow. It is also fun to work out your own patterns on graph paper, after you have done a few patterns from a book or magazine. When I see a new project or stitch on Pinterest or Ravelry or when I am looking at a needlework magazine, my first thought is always "could I work something like this in 1/12 scale?" Or if I'm in the mood to crochet tiny and don't already have a project in mind, I browse my needlework library and pattern books to select the design. Another great source of ideas is my collection of vintage crochet magazines. They are full of projects for the home (doilies and tablecloths and bedspreads) that can be adapted for miniature crochet if you scale down the thread and the hook and just use a single motif. For example, a single square from a bedspread might just right for your dollhouse bed, as long as your thread is fine enough. You might also be able to swap out triple crochet for double crochet (or double crochet for half double) to make the scale right. You also have lots of choice about what thread to use. I have a huge collection of tatting thread with wonderful colors. It is a little thicker than sewing thread and makes a very dainty fabric that is perfectly scaled for the dollhouse. My tatting thread projects usually require a size 14 hook. A perfectly lovely bedspread or rug can also be worked with heavier thread. I use cotton thread as thick as #30. I have found that a hook size 7 or 8 works best for the larger threads, as the stitches need to be loose enough to drape well. And don't limit yourself to just crochet cotton. I have used punch needle thread, flower thread, embroidery floss, lace-weight yarn, and even plain old sewing thread. If you are new to thread crochet, there are lots of how-to books out there. It is exactly the same as crocheting with yarn. If you slowly make the transition to thinner and thinner yarn and smaller and smaller hooks, you will naturally develop the skill (and muscle memory) to work with thread. Even though you might need magnifying glasses on some projects! I like to embroider miniature bedspreads too. I adapted a band sampler pattern from Shepard's Bush to embroider this miniature dollhouse bedspread. A single strand of embroidery floss keeps it all very delicate and perfectly scaled. A very soft palette of tan and mauve gives the project a nostalgic mood. I also used antique needlework stitches like queen's stitch and long-armed cross stitch, along with regular cross stitch. Even though I used a high thread-count fabric, the bedspread still needed a little something to make it drape well. So I added a row of straight stitches to both sides. I actually used sewing thread for this delicate bit, along with magnifying glasses perched over my regular bifocals. Notice how this delicate row of stitching gives the tiny bedding a graceful drape, and also accents the pulled thread and hemstitched edgings that I used. 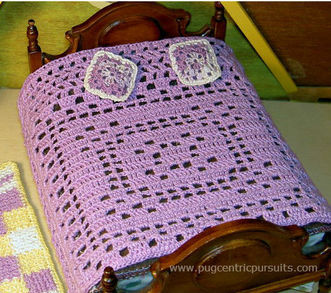 Crochet some matching pillows, and you have a One Of A Kind project to embellish your dollhouse bedroom. Embroidered dollhouse bedspread features antique needlework stitches. Pugcentric Pursuits. Here is a close-up of the hem-stitching and embroidered bands. Pugcentric Pursuits. This is a gallery of some of my older dollhouse crochet that has been sold. Crocheted dollhouse bedspread with bold stitches. Pugcentric Pursuits. Pink crochet dollhouse bedspread with fancy white edging. Pugcentric Pursuits. 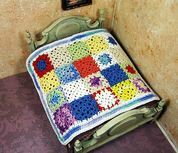 Miniature granny square patches make a country style dollhouse afghan. Pugcentric Pursuits. Miniature afghan worked patchwork style with tatting thread. Pugcentric Pursuits. 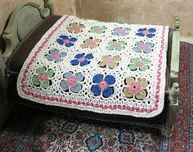 Hippie style dollhouse bedding with white miniature afghan. Pugcentric Pursuits. Miniature patchwork bedspread. Pugcentric Pursuits. Ecru filet crochet dollhouse afghan. Pugcentric Pursuits. Colorful miniature patchwork blanket. Pugcentric Pursuits.